On our daily paths, most of us move through spaces that offer very little in the way of inspired design. Our homes, work settings, retail spaces, and other stopping off points are filled with conventional design choices which fail to give us pause in appreciation, let alone challenge our aesthetic sensibilities. In an effort to bring awareness to spaces that have moved beyond the everyday in glass and mirror, I’m starting this Design Break series to highlight attempts to freak or funk things up a bit, whether they create a vibrant atmosphere or fall miserably flat. Either way, you’ve got to admire their daring. This is a photo of the vanity mirrors in the Calhoun Square public restrooms. There’s a backlit effect coming from the sides of the mirror, which is not exactly groundbreaking these days, but is still very much a popular trend. What I enjoyed was the playful goldfish motif and how the pattern spilled over into the mirror space. 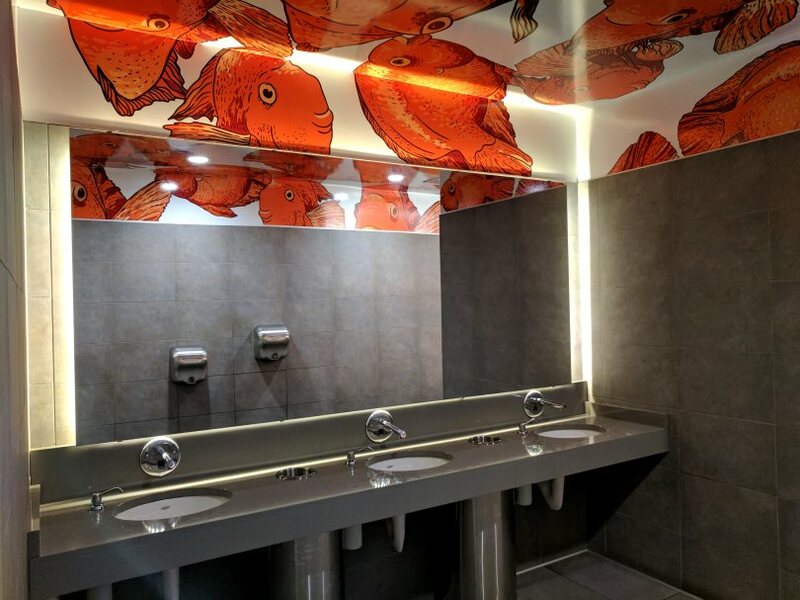 The designers took what could have been just another mundane commercial bathroom and with one simple idea injected it with color, visual dynamism, and a dollop of daft. That shows the true beauty of mirrors. With unique design features or the right frame, they can be captivating in their own right. But even the plainest mirror can highlight and expand an exciting motif, mess with our conception of space or in the very least move light around the room in useful ways.